I am so glad my last name isn’t Heap. However, I think I am going to start spelling my name Lauryk. I have no idea why I didn’t post this back when I read it. Now, I can’t think of what to say – except that it’s a good un. 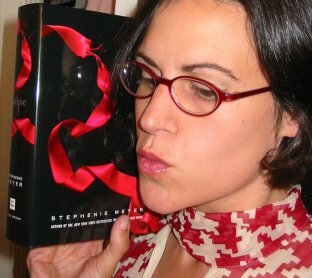 I like to threaten Mrs. Meyer that I will do certain bizarre things – and my latest such threat was that I was going to post a picture of myself licking her latest book. Licking/kissing – there were many boys I knew in middle school who thought they were the same thing so CLOSE ENOUGH. So far, this is by far my favorite book in the series. To be honest, I was a bit meh about the first two books. I could see how they could appeal to others, and I heartily recommended them to that group. They just didn’t rank high as personal favorites. However, this redeemed the series completely and now I am so smitten with the characters (especially Jacob – purrrrrrr).